OK some real research here. 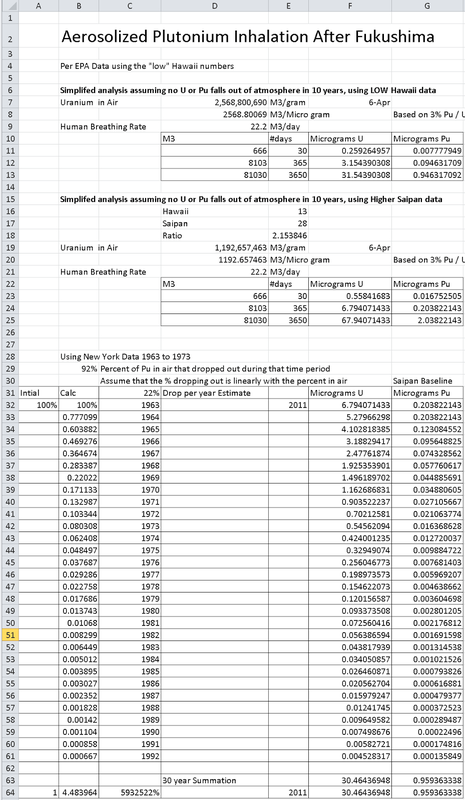 How much Plutonium was aerosolized and how much did the average human breath, and extrapolated to 30 years. This is good news folks. It means you are not likely to die directly from Fukushima fallout. In Beagles, inhaling 350 micrograms of plutonium was pretty much a death sentence. My research shows that fallout of Pu is about 22% a year from the air we breath. Over 30 years, we are all likely to breath in less than 1 microgram of plutonium, from my calcs. Some people say that even 1 microgram can cause a cancer, I agree. But "can" is a lot different than "very likely to kill you"
I will post the actual spreadsheet later for download. Fission products went in the atmosphere. If pu went it as a trace amount of the core. Trace levels. No adverse health effect. asshat, that was 6000 pounds of plutonium. 350 micrograms kills. That was horrible. Nukists should pay.